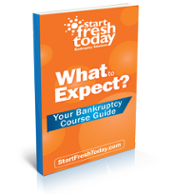 The bankruptcy process can be a challenging and confusing time. However, with the help of Start Fresh Today, you’ll be able to navigate the process as quickly as possible. Our platform not only offers these, but we’ve also put together a handy guide to explain the bankruptcy course process. Please provide your contact information and we’ll send you your free eBook! *By submitting your information via form submission, you consent to receive communications via email from CESI dba Start Fresh Today. We take your privacy seriously. Credit Counseling & Debtor Education are offered through EOUST-approved Consumer Education Services , Inc. (CESI), doing business as Start Fresh Today. CESI is approved to issue certificates in compliance with the Bankruptcy Code. Approval does not endorse or assure the quality of an Agency’s services.